Editor’s Note: The following is an advertising supplement that was published with the June issue of RISMedia’s Real Estate magazine. There’s a unifying focus that runs through every firm that comprises the HomeServices of America family of companies, a shared goal that has allowed the Minneapolis-based provider of national homeownership services to survive, thrive and advance for 20 years: to deliver an exceptional experience to its employees, agents, and the customers they serve. HomeServices has created a high-touch, service-focused experience to meet all of a consumer’s real estate needs. 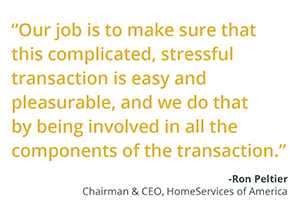 Bringing its core services—brokerage, mortgage lending, insurance, title and escrow, and relocation—together under one umbrella, HomeServices aims to make home-buying and -selling a seamless process for consumers. The mission is a tall order in a highly fragmented and rapidly changing real estate industry, but nothing less than that will do, because, bottom line, it’s what consumers are demanding. HomeServices’ full-service model has also helped contribute to the firm’s longevity and financial viability through the ups and downs of the housing market. 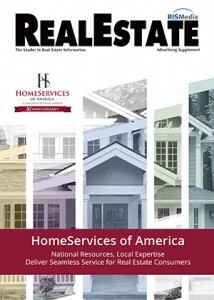 According to HomeServices’ Senior Vice President and Chief Administrative Officer Dana Strandmo, the full-service model is a well-oiled machine at HomeServices because—in keeping with its strategy of localized leadership—the core services are an integral part of the local HomeServices brokerages they serve. Of course, such an ambitious goal cannot be realized without a system-wide commitment to operational excellence and integrity. This guide provides a closer look at each of HomeServices’ core offerings—and how the leaders of these groups plan to meet the emerging challenges in their respective industries. HomeServices has grown its brokerage network by staying true to the philosophy and strategy it started out with in 1998: to acquire companies with excellent brands, experienced leaders and tested management skills, and welcome them into a family of companies where their real estate expertise is openly leveraged and shared. The brokerage brands acquired by HomeServices are intentionally kept intact, empowering local leaders to make operational and strategic decisions based on their own unique market conditions. “We believe in local markets, and we believe in local market insights and leadership,” says Peltier. The same philosophy holds true at HomeServices’ franchising arm, HSF Affiliates, launched in 2012 to represent the Berkshire Hathaway HomeServices, Real Living and Prudential Real Estate brands. HomeServices’ brokerage approach is all about achieving its brand promise: to do right by its customers, agents and employees. And the fulfillment of such a promise starts with the integrity and passion of Peltier, who then empowers his leadership at both the executive and regional level, and locally throughout the brokerage network, to deliver on that same brand promise. What makes the model successful is the proven appeal of the local brand together with the technological, operational, legal and financial expertise of the HomeServices executive leadership team. Looking to the future, HomeServices will continue to extend its brokerage services—locally, nationally, and now internationally through the Berkshire Hathaway HomeServices franchise. With a continued focus on agents and customers, HomeServices will continue to develop new tools and data-driven processes that will transform the way consumers engage with homeownership services as transactions unfold. Lenders play a major role in helping families attain the dream of homeownership, and HomeServices’ mortgage companies relish that role. Three independent companies—HomeServices Lending, Trident Mortgage and Prosperity Home Mortgage—comprise HomeServices’ mortgage offerings. While each are run and managed independently, they work closely together and with HomeServices’ network of real estate brokerages to provide a wide range of loan products and the convenience of a full-service shopping experience. There’s little room for mistakes in the lending process. That’s why the all-in-one services that the HomeServices brands provide bring a higher level of communication, transparency and collaboration to each and every transaction. As a result, everyone has a vested interest in providing top-notch service, says Tim Wilson, CEO of Prosperity Home Mortgage and president of The Long & Foster Companies Affiliated Businesses. Wilson points out that all three of the lenders within the HomeServices family are strong on the tech front. Each of the mortgage companies has its own consumer-facing mobile app that allows all parties to stay on top of each step in the transaction. At HomeServices Lending, the distinct competitive advantage of having loan officers sitting within affiliated real estate companies is two-fold: providing excellent service and streamlining communications, says Maureen Sammon, president, CEO and managing officer of HomeServices Lending. “Our loan officers get the advantage of being located in the real estate brokerage offices, but they still have to earn the business one agent at a time,” Sammon says. Beyond providing stellar service and an unrivaled settlement experience, HomeServices’ mortgage companies are also leading the charge to drive change as the lending industry evolves. Marie Gayo, president of Trident Mortgage, says that when new agents are hired within Berkshire Hathaway HomeServices Fox & Roach, REALTORS®, in-house loan officers are able to get in front of them and create touch points in ways that other lenders cannot. Each of the businesses also works diligently to bring the dream of homeownership to its diverse client base. Their teams work with state and local housing agencies, among other groups, to help buyers at all price ranges find affordable home loans and lower their costs of purchasing or refinancing a property. Their knowledgeable mortgage consultants advise on lending programs for first-time homebuyers, low-down-payment loan options and other opportunities that make homeownership a reality. Title and escrow professionals play a key role in bringing the final details together to ensure a smooth closing. HomeServices Title and Escrow companies do their part in this effort by offering a full array of title, escrow and closing services for buyers and sellers nationwide. The benefit of having local expertise in the markets they serve, along with the national footprint of multiple service brands under one roof, is a rarity in the title and escrow arenas. It’s also the key competitive advantage HomeServices’ Title and Escrow companies have on their side. 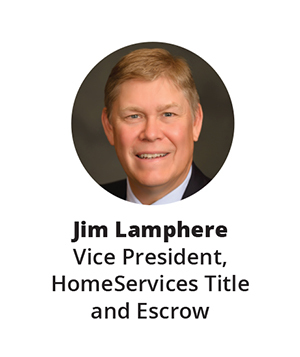 HomeServices’ business model helps eliminate the lag in many transactions where real estate agents, loan officers, escrow agents and other third parties don’t know how one another works, says Jim Lamphere, vice president of HomeServices Title and Escrow. “In our model, you know how other people work and communicate, and there are set expectations of how the work will flow,” says Lamphere. He adds that the consistent communications in the background help reduce misunderstandings that lead to headaches for clients. In 2017, HomeServices settlement experts processed more than 119,000 successful closings. Their high productivity is a result of understanding the intricacies of searching local properties, as well as the specific closing processes in the markets they serve, says Lamphere. That high level of accessibility results in more personalized service and gives consumers more confidence in the process. Across the U.S., there are more than 42 HomeServices-affiliated title operations, and many of them benefit from the resources offered by a national brand. One of those resources: the secure, proprietary HomeServices Exchange platform. While other title companies might advertise lower prices, Lamphere says pricing isn’t the right thing to compete on; service counts the most. Being part of the HomeServices family—an industry heavyweight that offers an all-inclusive shopping experience—helps its title and escrow professionals make a measurable impact on successful transactions. Shopping for homeowner’s insurance can be complicated for consumers, but the HomeServices Insurance Group of companies want to simplify the experience. Its companies are licensed to operate in 48 states and include HomeServices Insurance, Long & Foster Insurance Agency and Trident Insurance Agency, as well as other subsidiary agencies that are part of HomeServices’ local real estate brokerages. All of the company’s insurance agencies work only with A-rated or higher insurance carriers selected by A.M. Best. In addition to homeowner’s insurance, the companies offer a wide selection of policies including auto, umbrella, recreational vehicles, flood, earthquake, life and other personal insurance. 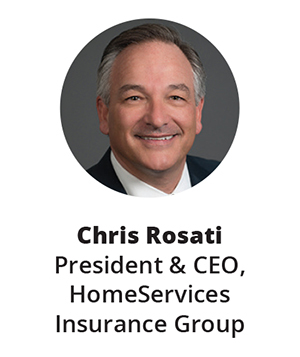 HomeServices Insurance advisors shop numerous insurance carriers to find coverage tailored to consumers’ needs—all while supporting real estate agents and loan officers to keep transactions on track, says Chris Rosati, president and CEO of HomeServices Insurance Group. Being part of a one-stop real estate services shop brings a transaction’s moving parts together in a seamless experience to ensure repeat business, and build goodwill with real estate professionals. One way HomeServices Insurance advisors add value to clients and real estate brokers is by providing the personal touch of a local insurance expert. HomeServices Insurance advisors work in local real estate branches and provide a high level of personalized attention, says Rosati. When employees have to relocate across town or across the country, HomeServices Relocation manages all the details: real estate, moving services, mortgage, title, insurance, closing, and getting them settled in at their destinations. Providing this fully outsourced relocation management service takes the burden of moving from transferees’ shoulders and reduces the client company’s overall expenses. For more than two decades, HomeServices Relocation has moved thousands of families around the world. It serves 150 active clients big and small in assisting their employees with settling into new homes. 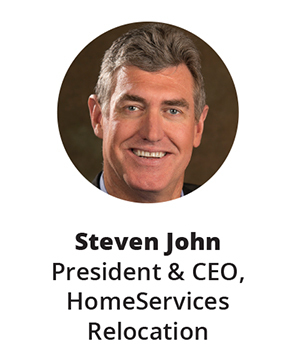 “In an industry where many competitors expect upfront payments or charge interest on transferees’ expenses, HomeServices Relocation stands apart,” says Steven John, president and CEO of HomeServices Relocation. “As part of the HomeServices family, we have ample capital and the ability to fund the largest transactions that come through,” says John, adding that many large relocation companies can’t foot those bills upfront. “Relocation is not just a human resources benefit; it’s a complex financial service we handle for our clients. Relocation involves tracking numerous expenses for each company client. HomeServices uses best-in-class global technology to manage those expenses, such as an updated tax engine and payroll interface. The systems ensure error-free, gross-up tax calculations, as well as wage and tax reporting. Also, transferees have easy access to their move details, and can submit expenses and view documents online and via mobile app. “There’s no company too big or too small for HomeServices Relocation to help,” says John. “We provide all-in-one real estate services supplemented with industry-leading technology, flexibility and, most importantly, genuine care for clients and their employees. Our track record has helped HomeServices Relocation achieve a 95 percent transferee satisfaction rate.